If you’re hosting a festive party over the Easter weekend, you might be wondering how best to create a sense of occasion. A perpetual quandary for the conscious consumer is finding ways to get into the spirit of things, without purchasing single use items that will end up in the bin. If you’re firmly against cluttering up the home with those bitty decorative things that you just won’t use that often, one solution for Easter decorating is to do it with food and flowers. Below is a hand-picked selection of simple, fun and contemporary ideas for creating a celebratory feel with consumables. Not only guaranteed to spruce up your Easter table, they’ll also fill your home (and bellies) with the joys of spring. 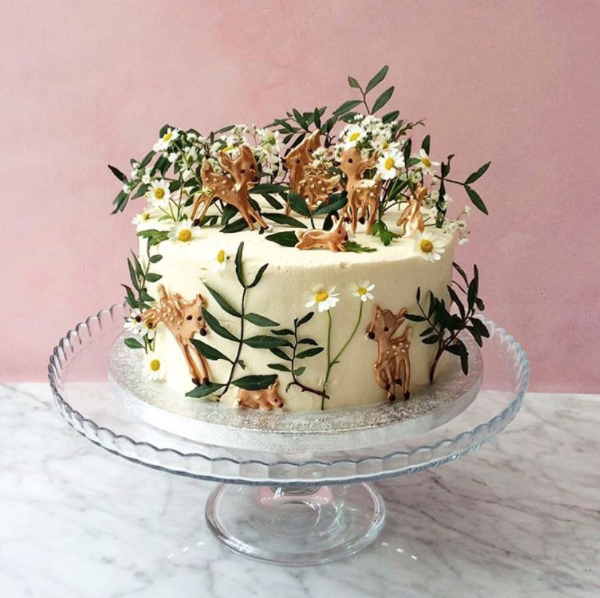 But before we go on, you must be wondering who made that wonderful spring themed cake pictured above – featuring piped chocolate deer and rabbits, no less. It’s by East London bakery Lily Vanilli, headed up by baker and author, Lily Jones. Be sure to check out more of their beautiful cakes over on their fabulous Instagram account. Proof that there’s no need to conform to the sugary and artificial bright colours often associated with this time of year. This idea comes from San Francisco blogger Liz Stanley, the author of Say Yes. 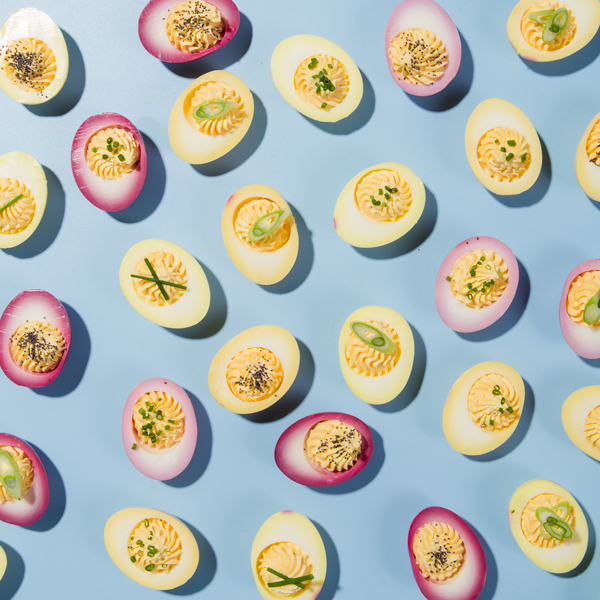 In her egg tea dying tutorial she uses rooibos, lavender, turmeric, chamomile, matcha, black, mate, blueberry and hibiscus teas to give these eggs their soft, muted colours. Nothing says spring like the smell of fresh flowers. As much as we love a daffodil, their particular shade of yellow can be quite hard to pull off in a modern home interior. 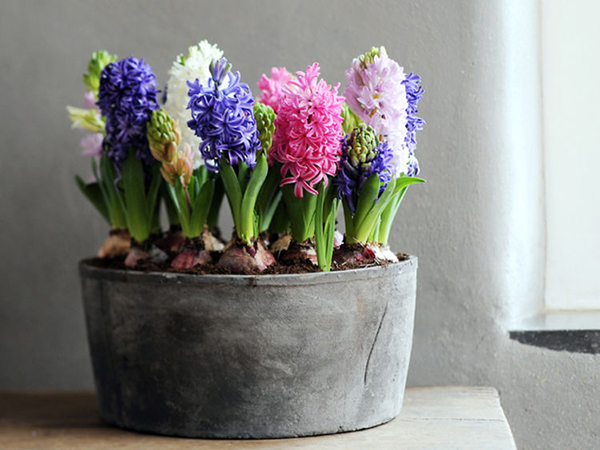 If you think they should stay out in the parks where they belong, another cheerful spring flower is the beloved hyacinth. Check out this article from Gardening Know How, which tells you how to care for them and keep them growing back for years to come. You can also learn about the wide range of British flowers on offer this time of year at The British Flower Collective. Easter craft projects are a great activity to do with kids, but will that awkwardly shaped crepe paper chick decoration (that now has one eye) really survive until next year? Baking biscuits or cakes is not only a fun and creative thing to do with little ones, there’s the added bonus of everything getting eaten. Traditionally in the UK, it’s the Simnel cake that’s associated with Easter, but you need to be a fan of fruit cake and marzipan to enjoy that one – which many are not. After discovering Coco Cake Land‘s green hairy witch cat cake, which featured in our Halloween for kids post, we suspected baking blogger Lyndsay Sung would have some equally wonderful ideas for Easter up her sleeve. 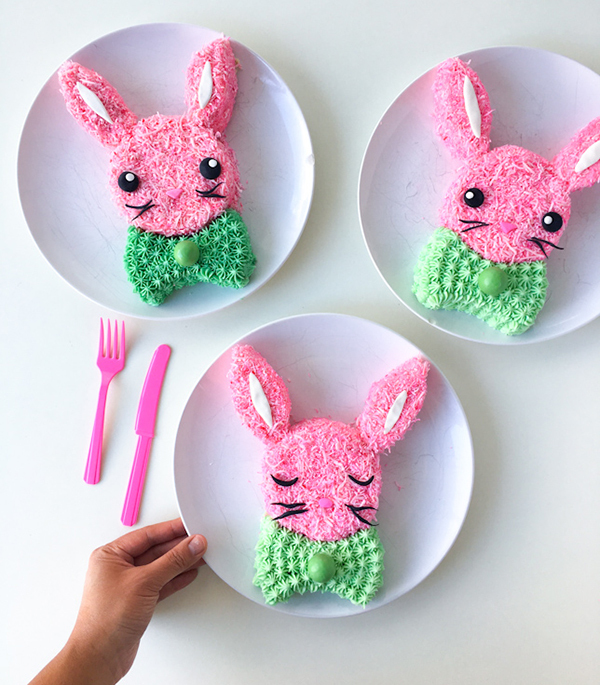 These Pink Bunny Cakes made from shredded coconut look like a guaranteed crowd-pleaser. Easter themed cookies provide an alternative for those with special dietary requirements and perhaps can’t eat chocolate. 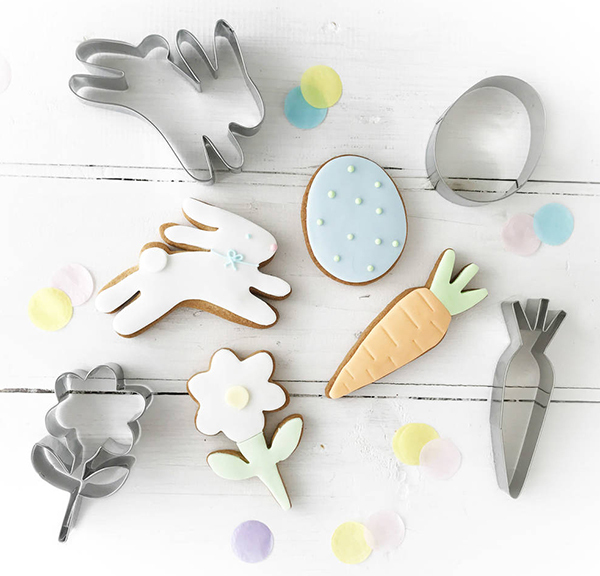 Try these cookie cutters from Not on the High Street* which feature bunnies, carrots, flowers and Easter eggs. Need a rest from all that sugar? These deviled eggs will offer a little savoury relief. The recipe comes from the fantastic blog Oh Happy Day and involves dying the eggs with red and golden beetroot. The answer to making any cake, pudding or cocktail look pretty and appetising is – edible flowers. 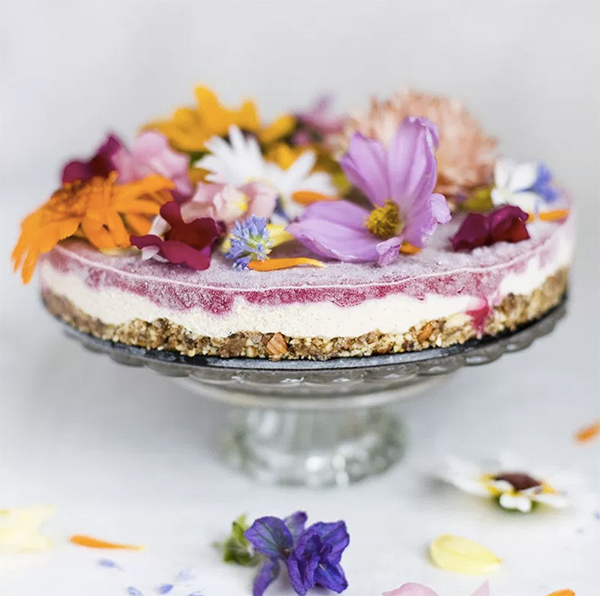 This raw vegan Flower Power Cake recipe come from Green Kitchen Stories and is packed with nuts, seeds, raspberry, pomegranate and goodness. In the UK, you can purchase seasonal organic edible flowers from Devon-based Maddocks Farm Organics. We also found some advice from The Royal Horticultural Society* on growing your own! 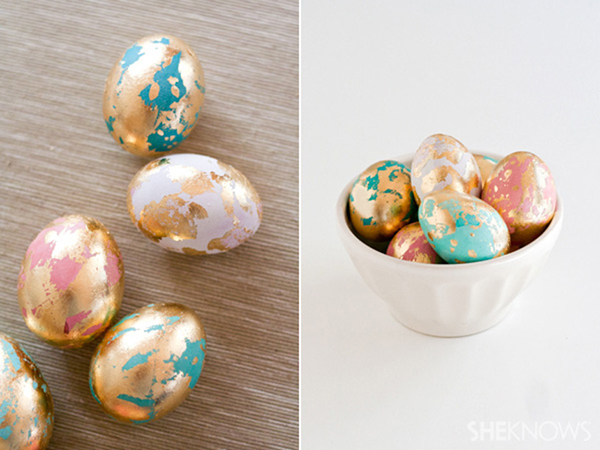 Some egg painting ideas require a pretty steady head to get them right, but this gold leaf egg tutorial from She Knows claims to be ‘error-proof’ – with very stylish results. One might even go as far as keeping these around as a permanent decorative feature. 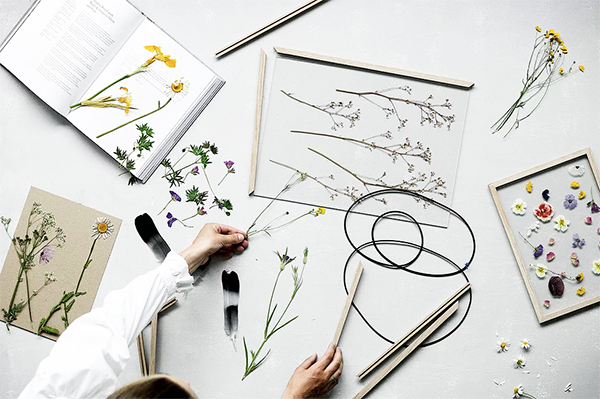 Flower pressing is a genius idea for anyone wanting to create an year round reminder of the joys of spring. It’s also instant artwork that’s very easy to make. 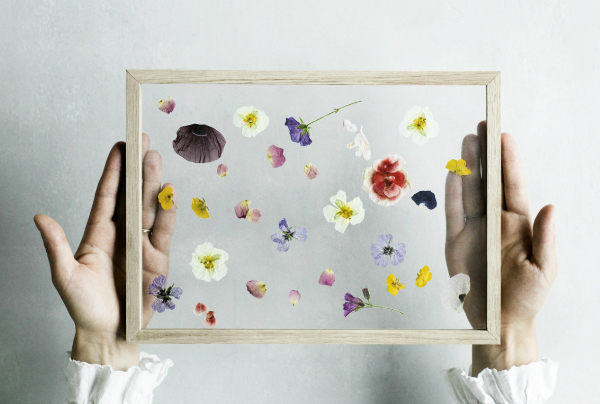 Danish company Moebe are the creators and producers of a product called Frame which is ideal for pressing flowers. From huge cheese plant leaves to pretty petals, you can have great fun styling your flowers and foliage in these. Since there’s no glue involved, you can also swap in something new whenever you fancy a change. They’re available in A5, A4, A3 and A2, with a natural oak or powder coated aluminium black or white frame, from Trouva. Also be sure to check out these transparent Kiko frames by Fairtrade brand Nkuku* made with recycled sari material. 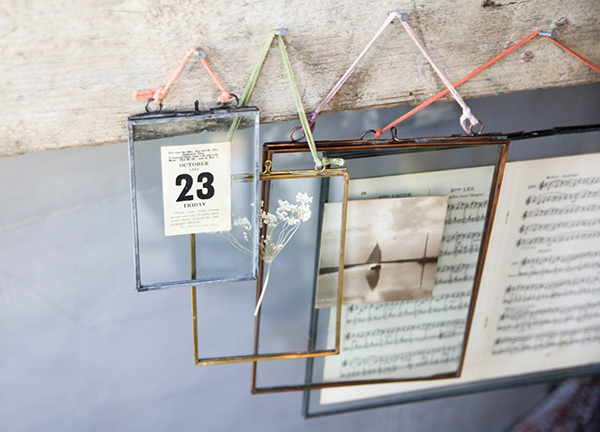 Similar products from Nkuku include the Kariba antique frame*, and Kiko photo box for collecting keepsakes. And the easiest way to Easter-ify your spread? A simple scattering of chocolate eggs. 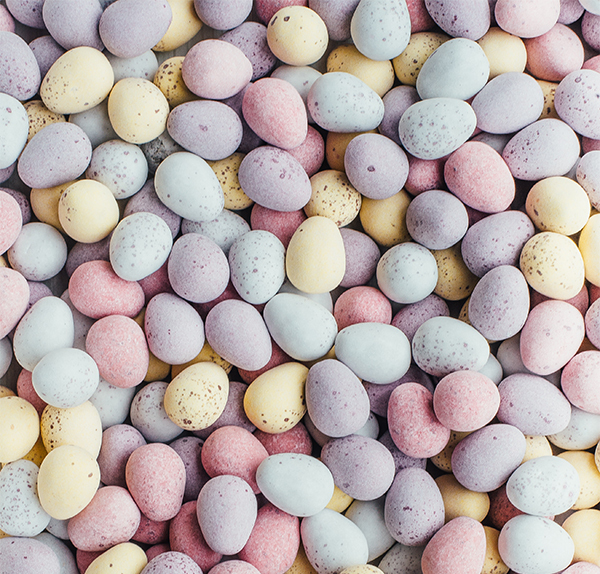 We’re a fan of the speckled variety of milk chocolate eggs* by Divine Chocolate, a Fairtrade chocolate company that supports cocoa farmers in Ghana. In addition, they strive to reduce the impact of packaging with triangular egg boxes and recyclable FSC certified card. Divine’s hollow Easter eggs* also don’t include any plastic. Available to buy from The Ethical Superstore*. 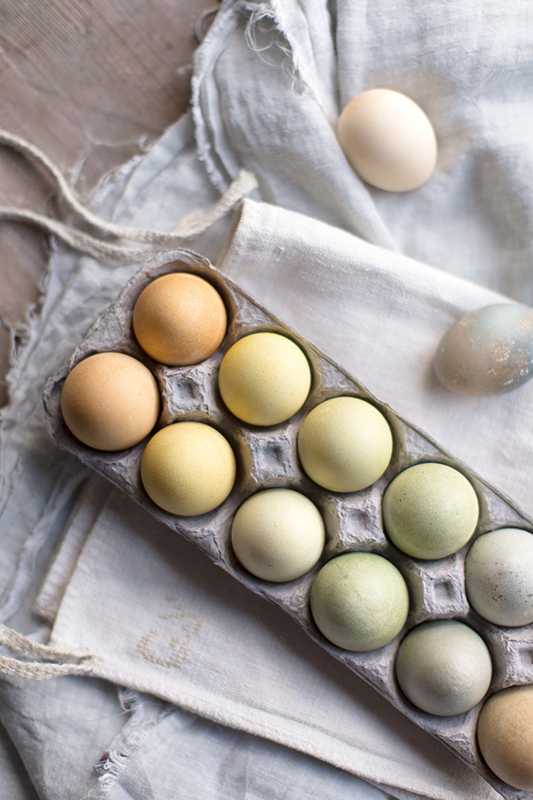 Do you have any egg-cellent ideas for Easter decorating? Let us know…!